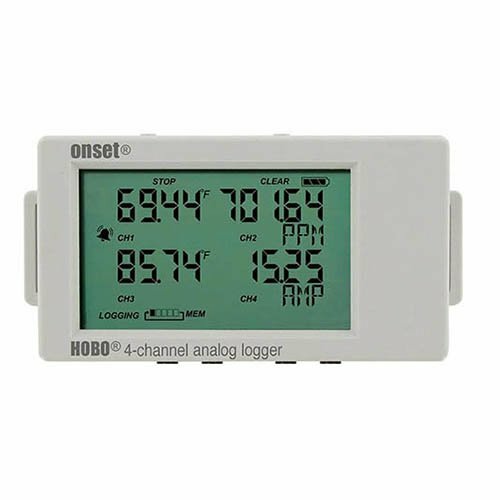 The HOBO UX120-006M Analog Data Logger is a high-performance, LCD display data logger for building performance monitoring applications. As Onset's highest-accuracy data logger, it provides twice the accuracy of previous models, a deployment-friendly LCD, and flexible support up to four external sensors for measuring temperature, current, CO2, voltage, and more. The data logger is ideal for energy audits, building commissioning studies, equipment scheduling, and more. IMPORTANT: HOBO data loggers require HOBOware software (USB interface cable included w/CD purchase). If you have any questions about this product by Onset HOBO, contact us by completing and submitting the form below. If you are looking for a specif part number, please include it with your message.